A laser level is used for many projects in construction in order to make sure everything is perfectly leveled to avoid future complications with whatever you are building. Anyone can find a use for a laser level, as it is beneficial for any project, big or small. So today we’ll have a look at how to use a laser level to level ground. It’s an easy job and a job that I enjoy a lot to do … once you know how to do it! If you are using a traditional level such as the pendulum or spirit level, it might be time to upgrade. 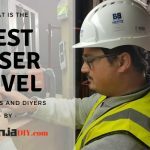 A laser level combines positive benefits of classic levels into what you might consider a ‘super level’ to get the best results. It might seem complicated at first, as it is a different process than using your traditional level. However, with the right information, a laser level will be your new best friend in terms of making sure your ground is 100% level. As we evolve, so does our technology. The old-school level that uses a bubble in liquid still has some good use in it, but a rotary laser level now holds the spot for the best level to use for large projects and heavy duties. A laser level will save you time, money, and labor. Gone are the days that you have to use a pencil and mark up the floor or walls, the laser will guide you through it all. The amazing thing about rotary lasers is their capability to provide 360 degrees of light that can show all levels inside or grading levels on the outside. It can be helpful for projects as intricate as building an outdoor pool or deck, and simpler projects such as mounting something large on the wall. The beam is everywhere, so all you need is a detector or your eyes. For new users of a laser level or a rotary laser level, the task might seem daunting. 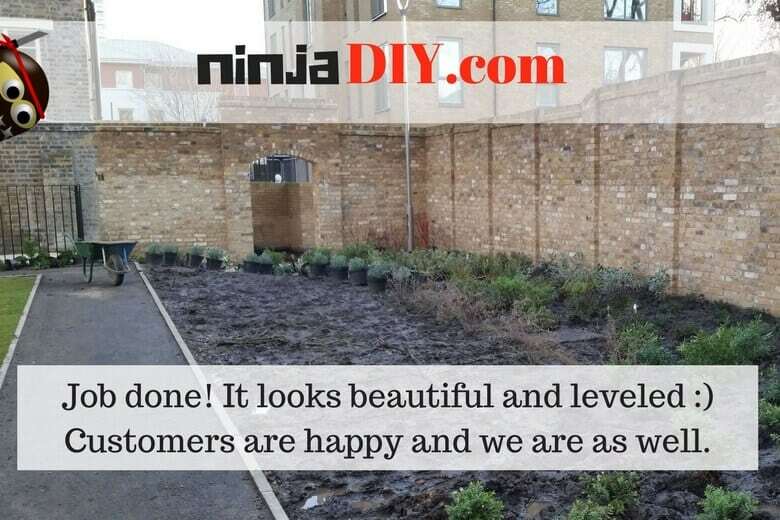 Luckily, after your purchase, there are only a handful of small steps you need to take to accomplish proper ground leveling, and the steps are simple enough that even an inexperienced user will be able to figure it out. First and foremost, you will want to know how to actually use the laser level before you attempt to level a ground area. To begin, you’ll want to set up your laser level on either a flat surface or a tripod. There are both manual levels and self-leveling models. If you have a manual leveling laser level, you’ll need to make sure the bubble is level. If it isn’t, you’ll need to locate the small screws by the vial and adjust them until the bubble vial is shown to be level. If it is self-adjusting, give it a minute to adjust and self-level. The next step is noticing how the unit releases the laser which will appear on your wall or anywhere your workspace may be. The laser will either show as multiple lines, a single dot, or a horizontal/vertical 360-degree level rotary laser. The laser may be hard to see outdoors, so sometimes a laser detector is necessary to ‘catch’ it. If you use a detector, connect it to the measuring rod. When the detector has found the laser, you will hear a beeping. You’ll need to move the detector down and up to find it. When you hear the beeping (or if you are inside you will see it) you have found your level. Make your measurements as needed after securing the detector to the rod. Now that you have a basic understanding of what the laser level is, options you have, its basic setup, and how to use it, you can now perform a ground leveling to begin your project and complete it without error. This process will be similar to a basic setup with a few extra steps. 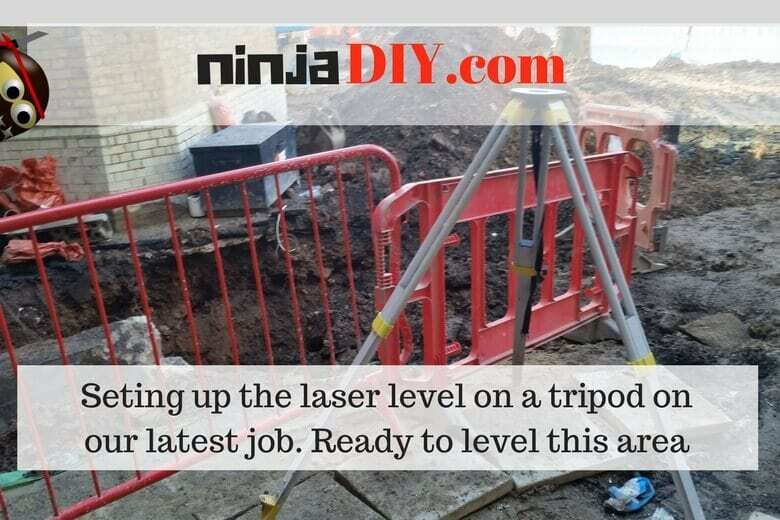 Get your tripod and laser level, then set it up on stable and flat ground. Turn your laser level on and give it a minute to self-level. If your product doesn’t self-level, then follow the previous setup step of adjusting the screws until the bubble is leveled. Choose your desired height on the ground. After this point of height is detected, put your measuring rod and laser detector together; placing the measuring rod towards this point. Move the detector up and down. You will hear beeping shortly after which means level has been found. You will want to tighten and secure the detector and the pole together, then find a different spot on the ground where the height intercepts with the laser. When the interception is found, you can either build a pile of soil or dirt to meet the height you desire or simply by making a mark on a stick or if you have a paint spray. You will want to repeat the past seven steps until you have many reference points that will enable you to completely fill the area. Always remember that this shouldn’t be a 5-minute process, it takes time and patience. You may need to continue adjusting and perfecting certain aspects, but when your project is completed and is perfectly leveled you won’t regret taking the time to purchase and use a laser level to level your ground to perfection. For this type of projects, you can’t really use just any laser. 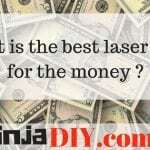 You might think: “Oh, it’s for my home, I can use a cheap laser version for this task ” … and our ninjas strongly advice against this kind of idea. Either has a contractor to do it for you where he will have all the PRO tools … or invest in a decent laser level for your project, you will end up using it for other stuff anyway. This one it’s a decent laser level for the money. It could be a good laser level for some builders, but it’s limited. Some of the best outdoor laser level that you can buy online. It’s not expensive and it’s really good quality. 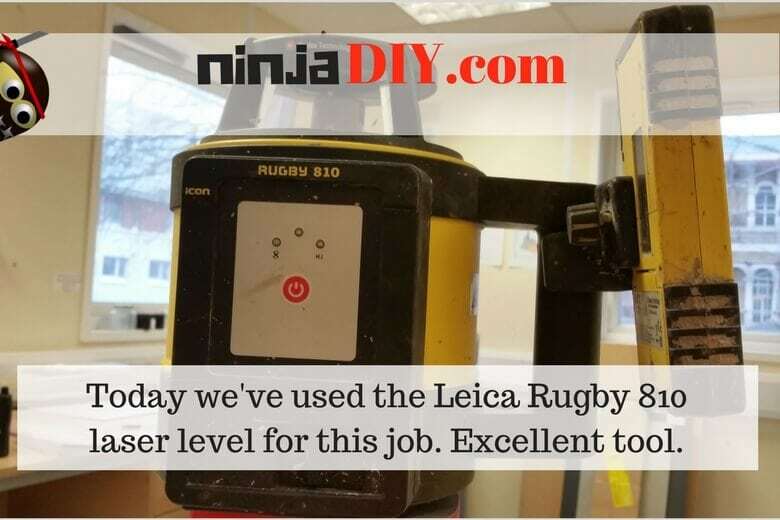 This is the laser level we have used and we are using for professional jobs … it might be a bit expensive for a small groundwork company … but if you have the budget … definitely, check this Leica laser level. Top of the range! That’s all … so depending on how much money you want to spend … you’ll base your decision on that.